I hope you love this easy DIY alcohol ink art tutorial because alcohol ink is my newest obsession. This will shock no one, but I really love making things! I hope that excitement comes across in my DIY tutorials, but I’ll let you in on a little secret: behind the scenes, sometimes I get a little frustrated when my DIY plans go awry. DIY often ends one of two ways: a euphoric high because my nutty scheme worked out (yay! ), or a frustrating feeling of grrrrr, because I ended up covered in concrete at midnight with nothing to show for it (true story). Alcohol ink art elicits neither of those feelings because it’s practically foolproof. Watching the ink flow is so mesmerizing that I just feel totally totally relaxed with this DIY – I don’t even care if it “turns out”. But it does! Every time. 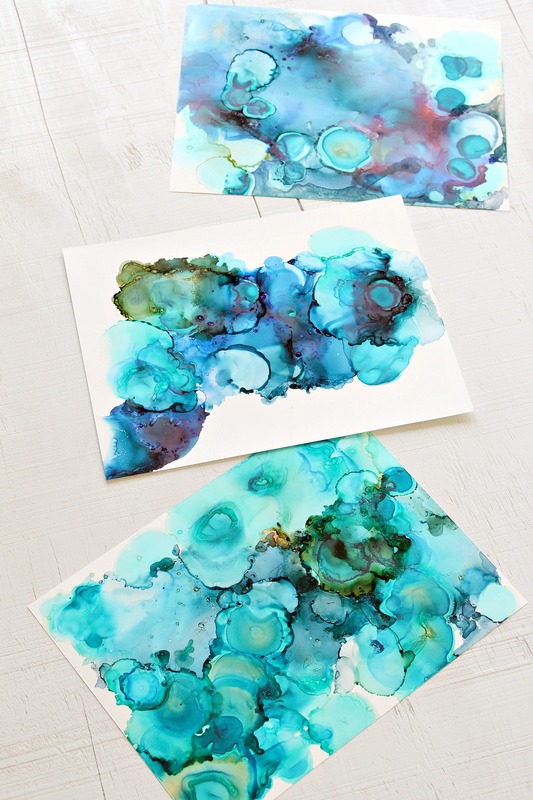 If you’ve enjoyed any of my watercolor-inspired projects (like my DIY ice dye pillows, watercolor stained plywood floors, or nail polish marbled pumpkins) then you’ll love this easy DIY alcohol ink art tutorial. After I shared a sneak peek at what I was making on my Instagram Stories, I got a ton of feedback asking for a crash course using alcohol inks. I’ve shared a lot of easy DIY art tutorials over the years (like my black and white painting, the colorful DIY abstract art I kept reworking, or the more recent abstract pair I painted for the bedroom) and each project has garnered lots of interaction from readers. Some people have felt inspired to make something (that’s my goal! ), but many others have written to tell me they’re still too scared/intimated/worried to try. I get that feedback more than you might imagine and it always makes me sad because making things can be so much fun. I am definitely not an artist – the only thing that separates me from the next person is that I’m fearless! I’ll try stuff, I’ll experiment and I’m willing to make mistakes. When I stumbled across alcohol ink art, I kept thinking about those people who wanted to try DIY art but didn’t. I wanted to share this easy DIY alcohol ink art tutorial for those people especially, because I promise you: alcohol ink is a truly easy medium to work with – even for someone who is a complete art or crafting newbie! With only a little coaxing and the right supplies, alcohol ink travels around in beautiful ways. The most difficult part is choosing which colors of alcohol ink to use – something my Mom learned the hard way, after inadvertently creating some designs I kept saying looked like certain body parts (careful mixing those peaches and browns in circular shapes!). 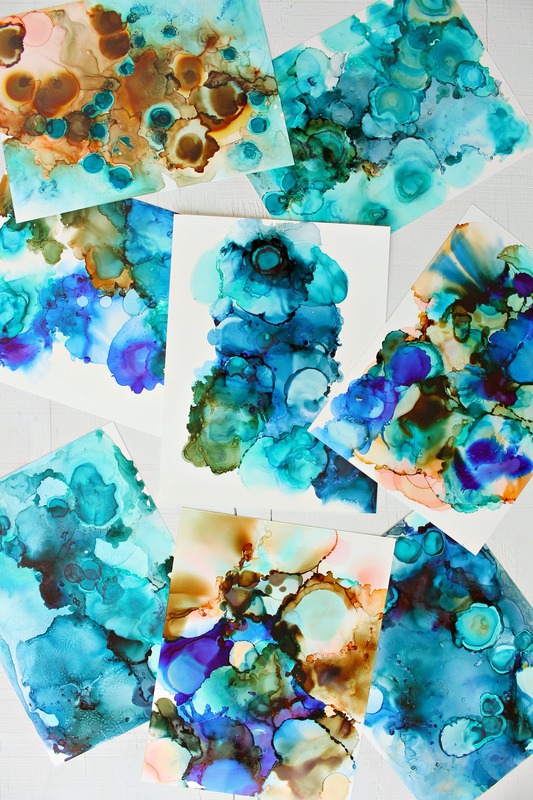 So, What Are Alcohol Inks? 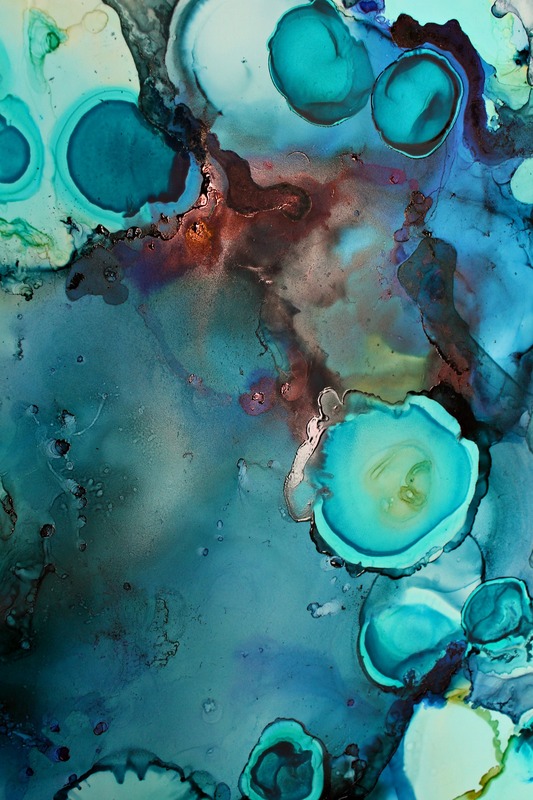 Alcohol ink is a quick drying, richly pigmented, and acid-free medium that works well on non-porous surfaces. These inks easily glide around a non-porous surface, allowing you to manipulate them into swirling shapes. Because they dry so quickly, you can layer colors easily – or use an alcohol blending solution to blend them together. The result can resemble marbling or tie dye and you can create areas with less or more pigmentation for a really “watery” effect. They also come in metallics, which I cannot wait to try – especially because some of these pieces really look like malachite and other stone, just begging for a little shimmering “veining”! What Supplies Do I Need for Alcohol Inks? You can use alcohol ink on many different surfaces, but to start you can buy a pack of special synthetic paper. Yupo is a waterproof material that comes in a nice bright white. It’s durable and super smooth, which makes it perfect for alcohol inks. I watched a few tutorials on YouTube but honestly they didn’t help because you can’t try to recreate something you see someone else make, you have to just go with the flow and the best thing to do is just play with alcohol ink, as opposed to try and copy something! My Mom came over and we spent an afternoon just moving the inks around and that experimentation was the best way to learn about alcohol inks. We began by dropping the ink onto the Yupo paper and then blowing gently with a straw. You can coax the ink around the Yupo by blowing air on it through a straw and it’s such a fun way to make designs and shapes. The ink has a mind of its own, especially when you add some drops of the alcohol blending solution (which helps slow the drying process). It will flow really nicely and you can even pick up and swirl the Yupo around. Something as simple as blowing gently, or giving the ink a big puff of air, will change how the ink moves. There’s no wrong way to do this. There are other, different techniques to try with the alcohol inks, but I still haven’t gotten bored with the basics. Experimenting with letting the alcohol ink dry and layering colors, as opposed to letting colors touch and mingle, or switching between adding the alcohol blending solution before or after the ink, produces so much interest and depth. Even the amount you blow, and how much that spreads out the drop of ink, impacts the final design by creating more sheer areas of color. Like ice dyeing, by using a single color of alcohol ink you’ll see undertones pop up – a bright fuchsia appeared from the blue I bought and seeing these new colors emerge was part of the fun. Can you believe that’s all it takes? 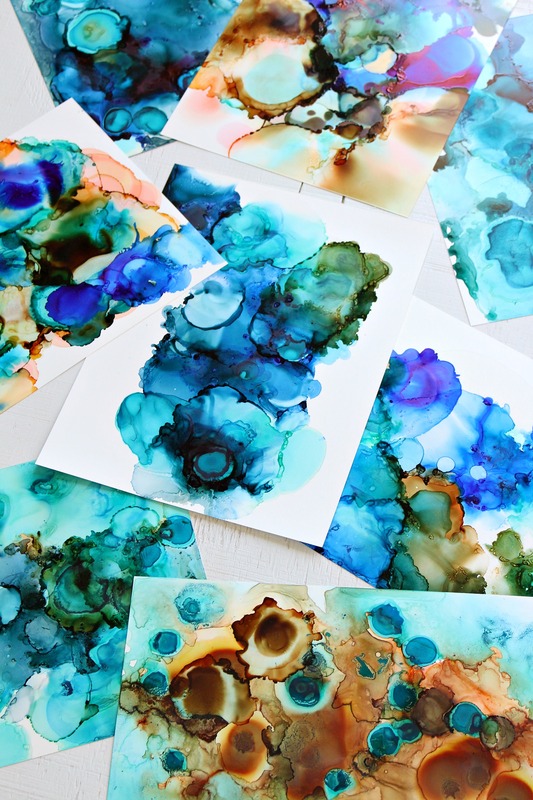 You can barely call this a DIY alcohol ink art tutorial. Just drop some alcohol blending solution, some alcohol ink, and blowing it around with a straw! Once you have that down, just keep adding drops of ink and blending solution and let that ink move around the yupo. The best tip I can give you in this DIY alcohol ink tutorial is to cover your work surface and also wear some thin rubber gloves. Alcohol inks STAIN and it took a few days for my hands to fade back to my natural skin tone. Can I skip the Alcohol Blending Solution and Use Rubbing Alcohol? 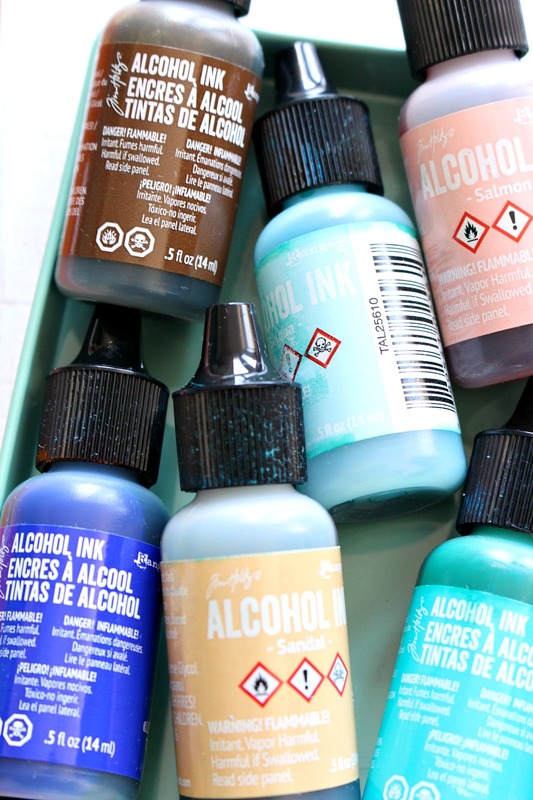 The alcohol blending solution is expensive and we went through almost an entire bottle in an afternoon of experimenting – but I did also tackle quite a few DIY alcohol ink projects at the same time. The alcohol blending solution contains ethanol, glycol ethers and isopropanol, whereas rubbing alcohol only has the isopropanol. The blending solution has a stickier feel and also leaves behind a sheen. We tried using regular rubbing alcohol also and it works, but the pigment comes out of solution a little bit with rubbing alcohol. If you try both, you’ll notice a difference but honestly it’s not dramatic, and so if you’re planning a big craft night and trying to keep costs down, then a big old bottle of rubbing alcohol works too. But for your first time experimenting with alcohol inks, spring for the alcohol blending solution at least once – we ended up toggling between the two, and using the solution and rubbing alcohol for slightly different techniques. You can also find alcohol blending pens, which would really help create more controlled pieces with more advanced techniques. I hope you liked this easy DIY alcohol ink art tutorial and that you feel inspired to try these inks. If you try painting with alcohol ink, let me know! And you know that I love when people tag me on social media (I’m @danslelakehouse everywhere) to show me what they made. In addition to framing these beauties, aren’t there companies (spoonflower?) that transfer art onto fabric? In the photo just above “How Do I Use Alcohol Inks?” I see the lower left as an outdoor fabric lumbar pillow. And maybe the center one, with all the white, as a tea towel? Always love these colors! Oooo I am liking that idea!! Oh, this is something I think I could really get into…I see note cards in my future! Love the colors you have used. Thanks for sharing, Tanya. I’m a total newb, so please forgive if this is an obvious….how would you hang this or showcase this? I have just spruced up my LR (only after living here 9 years) and I want to hang some inexpensive art. Thanks! I would just grab some cheap frames from Ikea or Michael’s and frame them like you would a photo. You can always trim off a little if you need too. Basically it’s like a shiny sheet of paper – it’s probably difficult to tell from photos how thin it is. I really like the outcome of this — do you think there’s any way to get this effect on fabric? (without getting it printed onto fabric, like one poster mentioned) I guess I mean, you can’t use these inks on fabric right? I’ll definitely have to try my hand at using alcohol inks on fabric and report back 🙂 I love alcohol inks so much, they’re so fun! And easy! So I – we – did this last night using inexpensive 6X6 bathroom tiles. I even managed to get my husband to have a go. We did a lot of experimenting and it was a great deal of fun. Already, just one night into this, we have a few pieces worthy to show. My recommendations? Try a straw instead of a blow dryer. There is a real difference between just applying colour after colour and letting each colour dry before applying a new one. It is worth experimenting with both. By doing the latter, I managed to make a flower. Good luck and have LOTS of fun! I did use a straw! I never thought to use a blow dryer, interesting. So excited to hear your tiles turned out great and that even Hubby tried this project.